Oakland finally gets a dedicated home for theater. The Flight Deck's directors: Michael French, Laura Lundy-Paine, Lindsay Krumbein, Dana Lawton, Amy Sass, Anna Shneiderman, Amanda Bornstein. For all of Oakland's recent attention as the Bay Area's new cultural epicenter, the city is still lagging when it comes to theater performances and space. But that is about to change. 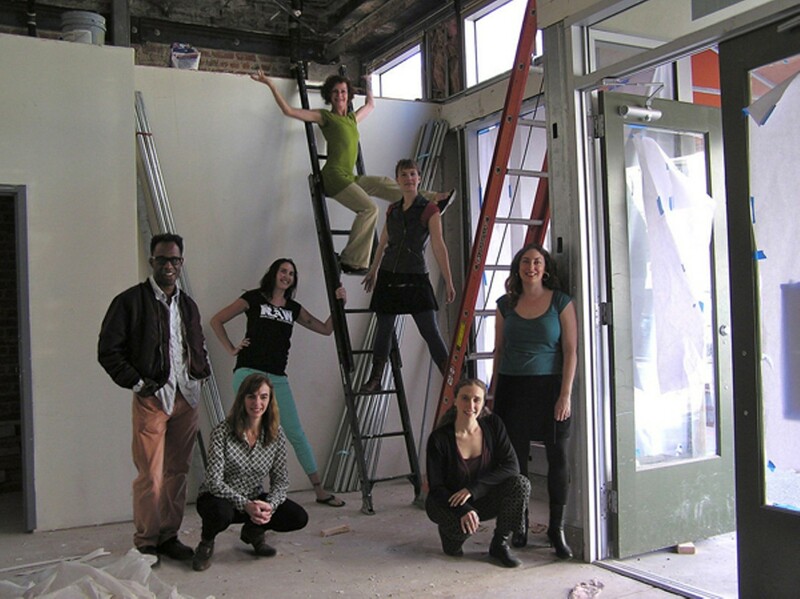 After four years of location-hunting, crowdfunding, construction, and gathering city and community support, organizers will open The Flight Deck, a multidisciplinary arts space and theater venue, on Friday, June 6. A project of Ragged Wing Ensemble, which has been producing theater works all over the East Bay since 2004, the Flight Deck is celebrating its grand opening with a full week of events, including dance, improv, and other performances, panel discussions, literary events, gallery shows, artist talks, and more. The opening night kickoff will include a collaboration with Flight Deck's neighbor, the farm-to-table Township Restaurant, as well as the group exhibition Just Ripe, a wine and cheese reception, and outdoor performances at Latham Square, just across the street from Flight Deck. The ticketed portion of the evening includes After Juliet, a play by Gritty City Youth Repertory Theatre at 7:30 p.m., as well as a party, which runs from 7 p.m. to midnight and includes a limited dinner menu, performances, art tours, live music, DJs, and dancing. Tickets for the party are $25 at the door. The full week of Flight Deck festivities (June 6-14) will include tribal ballet classes (June 11), clown workshops (June 10), panel discussions on Oakland's culinary revival (June 7), and short, original plays followed by contemporary dance by Adara Dance Company (June 12). Each event costs between $10 and $35, based on a sliding scale, and a pass to all the week's events costs just $35. "Oakland is long overdue for a space like this," said Lisa Drostova, Ragged Wing's Public Engagement Manager (and former Express theater critic), noting that Berkeley has more than half a dozen theater spaces with resident companies. Oakland has Woodminster Amphitheatre, which puts on musicals, but only during the summer months. Malonga Casquelourd Center for the Arts also does occasional theater shows, but doesn't have resident companies, and "it's been years since TheaterFIRST had their space in Old Oakland," Drostova noted. The Piedmont Oakland Repertory Theatre is another company attempting to get its feet off the ground in Oakland, and until recently was performing in a synagogue in Piedmont. According to Piedmont Rep's website, the rent increased, however, and now the company is homeless and seeking a space for its next production. Sustaining theater in Oakland in any kind of long-term sense has been a challenge for years, which is partly why the idea of a dedicated theater and artist space in Oakland's burgeoning arts district is so exciting. The goal of Flight Deck, as Artistic Director Amy Sass put it, is "to create an affordable home for artists of various disciplines who want to put down roots in a thriving community such as Oakland." The space will include a 99-seat black box theater and various workspaces for artists, such as a gallery, rehearsal studio, common area, storage, conference room, and co-working office. "The hope being that performers in particular will not need to go to San Francisco to get this kind of space," said Sass, who noted the importance of sharing resources and collaboratively governing the space. Sass hopes Flight Deck's settled residence and cooperative model will "foster a deeper investment in the success of each other's work and the evolution of artistic collaborations across disciplines — collaborations that might not have happened if folks had remained nomadic." Nestled in Oakland's Uptown district, at 1540 Broadway, the Flight Deck's new home is a massive exposed-brick space in a location that has stood unoccupied for decades. When asked why Oakland's theater scene has yet to match pace with the rest of the city's growth, Ragged Wing Ensemble Executive Director Anna Shneiderman offered a few theories. One was that the traditional theater audience — namely the older, white, and well-to-do — doesn't "describe Oakland's population very well," and another was that there is less institutional funding for the arts in the East Bay compared to San Francisco. "So many non-profit theaters have been hesitant to base their operations in the East Bay," she wrote in an email. But that is changing. "In the 1900s-1950s downtown Oakland was a theater district with several large, popular theaters, but since mid-century, they have fallen away and until recently, downtown Oakland has not been a place that people have gone for nightlife," she continued. "In the past decade or so this has been changing, with many new bars, restaurants, and music venues opening up. Now it's time for theater and the performing arts to catch up again and become part of the bustling cultural destination that is downtown Oakland." As Oakland continues to shift and adapt with the changing tides of gentrification, the Flight Deck will be an important marker for those interested in bringing the focus back on community. "We can learn from each other," said Sass. "Share and support and make each other stronger. This is an important thing during an age when it is a giant task to make arts organizations sustainable, vital to a specific community and in service to the artists and audiences alike." In addition to rehearsing and putting on shows, resident companies — which thus far includes Gritty City, the Aluminous Collective, Virago, Dana Lawton Dances, Kabinet of Kuriosities, and the Lower Bottom Playaz — will help govern the space and create the community. "These are vital, exciting groups that will finally be able to focus on creating work and not worrying about hustling space for every rehearsal and performance, something I can tell you from experience as an actor and director is exhausting," said Drostova. "Instead, they can rehearse, perform, and do their administrative work in one place that isn't a basement or community room." 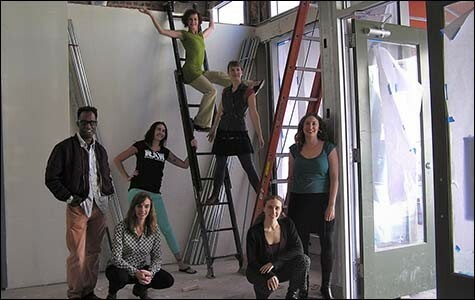 Membership opportunities also exist for visual and performance artists and individuals seeking a co-working space. "As theater audiences change, the places we go to see theater change," wrote Shneiderman. That is definitely true, and even though Flight Deck has just gotten started, the space is already almost completely booked through July 2015, which proves that the demand is there. "We believe in Oakland and its heart," Drostova said. With a little time and community support, the burgeoning performance center could really take off. Check out the full schedule of events at TheFlightDeck.org.